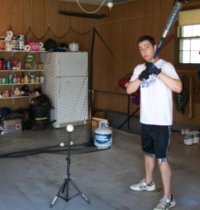 How to pitch a baseball covers the basic steps of pitching. 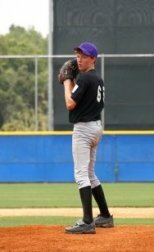 If you are looking for something a little more advanced, we have a whole section with over a dozen articles located at Pitching. And if you want to learn how to throw certain pitches, we have another whole section for that titled Pitching Grips. So, if you are still here, let’s get started on the steps of how to pitch a baseball. 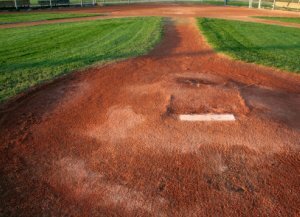 In high school baseball and above, the pitcher stands 60 feet and 6 inches from home plate. The distance is shorter at younger ages, and the distance depends on the age of the players. The pitcher stands on what is called the pitching mound, which is an elevated hill. At the top of this mound is a white strip of hard rubber, called the pitching rubber. A pitcher must be touching the pitching rubber when he starts to pitch the baseball. The first step in how to pitch a baseball is in the delivery. When the pitcher throws the baseball to the catcher, this is called the pitching delivery. There are two different types of delivery. The first type of delivery is called the wind up. A pitcher usually does this when there are no runners on base. He starts the wind up by facing home plate. He then strides back with one foot, while keeping the other foot still touching the rubber. The foot he strides back with is the one on the same side as his throwing arm. Once he steps back, which is done to gain some momentum, he strides forward. He holds the baseball back behind him and then as his body comes forward, he brings his arm over the top of his body and throws it towards home plate. All of this motion intended to deliver the baseball at a fast speed. The other type of delivery is called pitching from the stretch. A pitcher usually does this when there are runners on base. 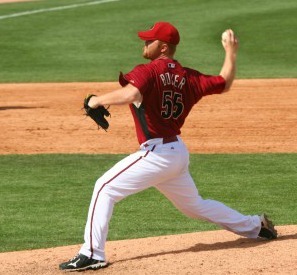 A pitcher’s delivery is much quicker throwing from the stretch. This helps to prevent runners from stealing bases. A right handed throwing pitcher starts the stretch by facing third base. And a left handed pitcher starts the stretch by facing first base. Next, instead of stepping back, the pitcher just leans a little back and then strides forward and throws the baseball to home plate. Like I said before, this delivery gets the ball to the catcher must faster and helps hindering the runners from trying to advance to the next base. That covers the simple basics of how to pitch a baseball. But there are many other aspects of pitching that you will need to know. One thing you want to also know is the type of pitch to be thrown. 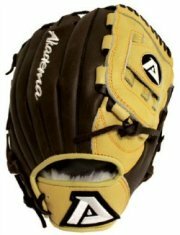 There are dozens of different types of pitches. They all make the baseball act differently. For an example, a fastball is the pitch you would probably throw most often. It is thrown hard and is usually your most accurate pitch. A curve ball when thrown correctly “bends” once it reaches home plate. A change up hopefully looks like a fastball, but arrives a little slower. This is to keep the batter off balance. And there are lots of other different types of pitches. Our selection of pitches can be found at “pitching grips”. 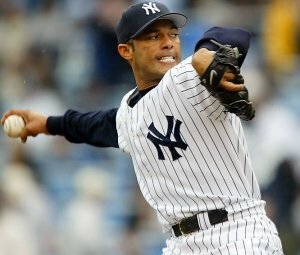 The angle of your arm when throwing a baseball is another aspect of pitching that can be different. The angles vary from straight over the top to a pitch that is called a submarine, which is almost like throwing underhand. 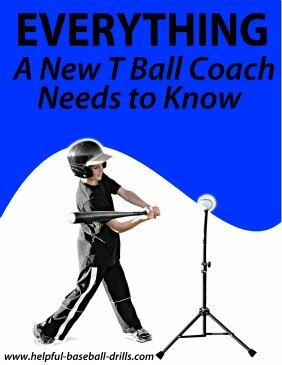 Every pitcher has to find the right pitches for him and also the right angle of his throwing arm. How to pitch a baseball is something that every pitcher is always tinkering with. Just like the hitters he is facing, a pitcher is always trying to improve. So go give pitching a try and start tinkering with your pitches.